The climate of West Africa is subject to some of the most variable rainfall patterns seen anywhere in the world. In the past the area has been hit by periods of prolonged and severe droughts which have had strong consequences on the livelihoods of many people. These populations are growing and are increasingly vulnerable to changes in the climate trends, particularly on the short to medium term. By combining West African skills and knowledge of the needs of urban planners and agricultural sector with expertise from the UK and France the AMMA-2050 team aim to improve understanding of the variability of future climate. The AMMA-2050 team will investigate how physical processes interact to cause ‘high impact weather events’ such as storms and heat waves that affect lives and livelihoods. Not only will they look at how the total amount of rainfall is likely to change – but also at how rainfall is likely to be distributed throughout the wet season. For example, heavy rainfall concentrated in just a few hours places great stress on human settlements, infrastructure and agriculture. By applying expert judgement, they will identify adaptation options in water resources and agriculture. 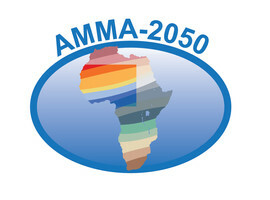 AMMA-2050 is part of the Future Climate For Africa programme, running from 2015 to 2019. The AMMA-2050 project aims to improve understanding of how the West African monsoon will be affected by climate change in the coming decades – and help West African societies prepare and adapt. This initiative combines observations and climate models with new, cutting edge methods to assess how the West African climate is likely to change over the coming decades. It builds on the largest multi-disciplinary research effort ever undertaken on Africa’s climate and environment, the African Monsoon Multi-disciplinary Analysis (AMMA, 2003–present). The AMMA-2050 team will work with decision makers and affected groups to jointly develop tools and approaches which can support them in using improved climate information. The two sectors that are particularly relevant to livelihoods are urban planning (a key concern due to the growing populations of cities) and agricultural cultivation schemes (where large sections of the population still depend on subsistence farming). how urban planners use information on flooding to make their plans. what crops traits/varieties are needed in a future climate. The aim is for both urban and agricultural actors to have improved tools that aid them in designing strategies that are robust for a future climate. The research and capacity building work AMMA-2050 will undertake in partnership with African, UK and French partners will result in a workforce able to lead decisions that are relevant to West African nations. Therefore the team's proposed work is designed with excellent science at its core but will work with social scientists to aid in understanding how best to make use of the project outcomes. Furthermore end-users have an important role as their needs are included in the design of the project making sure the results coming out of the project are in a format that is easily used by them. Improved resilience is an important aim for AMMA-2050 and it starts with improving our understanding of the climate signal over the West African region and leading through to how decisions are taken in very specific pilot studies that showcase the importance of having access to improved science outputs. AMMA 2050 is one of the five research consortia which form the Future Climate for Africa (FCFA) Programme, jointly funded by the UK Department for International Development and the UK Natural Environment Research Council.